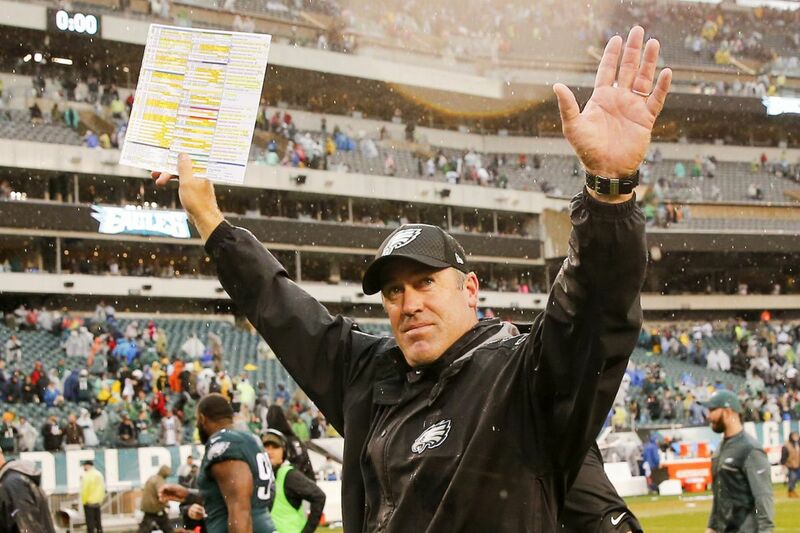 Eagles coach Doug Pederson celebrates his team’s 33-10 win over the San Francisco 49ers at Lincoln Financial Field on Sunday. "The Philadelphia Eagles are now, officially, the best team in the NFL." That's how the team at Sports Illustrated's Monday Morning Quarterback summed up the 7-1 Eagles' leapfrogging the Patriots to top its NFL power rankings for the first time all season. And that was before the Eagles acquired Pro Bowl running back Jay Ajayi from the Dolphins. Nearly every other national outlet agrees. Even the 80 writers, editors and on-air personalities that vote on ESPN's power rankings finally moved the Eagles to the top of their list. In fact, there was only one national outlet that didn't rank the Eagles No. 1 in a power rankings: the Washington Post, where Tom Brady and the Patriots remained in the top spot on Mark Maske's list. To be fair, Maske had the Eagles ranked first back in Week 7 when most outlets still had the Chiefs on top of their lists. In an email to Philly.com, Maske said the Eagles are clearly the best team in the NFC, and might have actually topped the Patriots if not for one huge injury. "I had the Eagles ranked first and then dropped them behind the Patriots in part because of the injury to Jason Peters. Losing a very good left tackle during the season has a significant impact on a team and, in this case, I thought it justified moving the Eagles down one spot," Maske said. "It's obviously a very subjective exercise and I try to make it about teams' current level of play and potential to maintain that level of play going forward, instead of being only about what everyone's record is." The Eagles own the NFL's best record right now, but will that last once the schedule toughens up? The Eagles have played the third-easiest schedule and have big tests against the Broncos, Cowboys, Seahawks and Rams coming up. The Eagles stay perched in the top spot, Eagle-y. Thought at the beginning of the season that Philly had a real chance to be one of the wild-card teams, if not challenge for the NFC East title. Now fans are thinking home-field — and why shouldn't they? Carson Wentz is a legit MVP candidate. The Eagles are playing solid ball on offense, defense and even made some hay on special teams Sunday. Perhaps most importantly, Philadelphia did what good teams are supposed to do against weak opponents, especially at home: win decisively. How many of the supposed contenders haven't done that this season? The Eagles are a top-flight team … THE top-flight team. If the Dolphins were trying to send a message to Jay Ajayi by trading him to the best team in football, he's probably not upset about receiving it. Philadelphia, plain and simple, is the best team in football. This wasn't the Eagles' best game. Wentz seemed a bit off. Yet, the Eagles ultimately got the job done against a team they were supposed to beat. The defense made some big plays to help take over the game. When the 49ers got a touchdown to bring the game within two scores, the offense did what it's done often this season and answered. The Eagles are hot right now, and they know what their winning formula is. They have a balanced offense, can get a few long plays from Wentz and can lean on a dominant front seven. Even when Philadelphia isn't playing at its best, it is hard to beat. Prevailing at home against the winless Niners was not exactly a major accomplishment. But beating the teams you should beat is part of the equation for being good in the NFL. It's no longer early in the season and it must be acknowledged at this point: The Eagles are the NFC's Super Bowl front-runner. With how well Carson Wentz has played, it's surprising Alshon Jeffery has been so quiet. His long touchdown catch against the 49ers was just one play, but maybe that's the spark. If Jeffery plays like the true difference maker he has been in the past, the Eagles get a lot better. And they're already pretty good. Lost amid Carson Wentz hoopla is defense coming off its best performance of season and run game that features four players with 130-plus yards. Some will say it's the long-awaited fulfillment of their destiny. Others will argue it's a gross miscarriage of justice. The debate will rage, turning neighbor against neighbor, but the fact remains: Carson Wentz and the Philadelphia Eagles are now, officially, the best team in the NFL, leapfrogging the Patriots in this week's Power Rankings Poll.